if she wants her year to really count. It takes more than brains, you know, to be a success. It’s not too early to plan your wardrobe now. Yikes - times have certainly changed! I would like to think it takes more than clothes to be a success. I believe I will stick with my vintage dresses and leave this particular antiquated ideology in the past, thank you very much! I like to dress up because it is fun, not because it is compulsory . . . although, the college campus of today could certainly use a bit more style. If you are going to wear pajamas to class, they might as well be stylish! Lovely clothes. It's really not that much when you think about it. Three dresses, two suits, pajamas and robe, P.E. uniform, and one party dress. College students today have so much more in their wardrobes but nothing so nice usually. I'd love to have this wardrobe for myself. I wonder when they say, "If she wants her year to really count...", if they're actually talking about one of a series of years necessary to complete a program, or if young women of the time went to college with the expectation that in one year's time, they would be married (or at least meaningfully engaged)? Is that the "success" this article is hinting at? Anyway, thank you for posting this. I love looking at these scans. "Husband hunting" is an age old pursuit. So much was blatantly predicated on doing that; old advertising copy, song lyrics, and of course, sewing related reading material. My father in law went to the University of Mississippi in the 1960s and they did not allow blue jeans to be worn to class, much less pjs. Dress pants, buttondown shirt, and dress shoes were required for men. He always got fighting mad when he would go to football games and see what the "kids" were wearing. Agreed on all points. I do wish that there was still more of a general culture of dressing up for class though - vintage collegiate style, as well as a classic preppy aesthetic, are two of my all-time favourte looks (especially for fall). I always enjoy looking at and reading these old publications. What a fun insight into an old way of thinking. 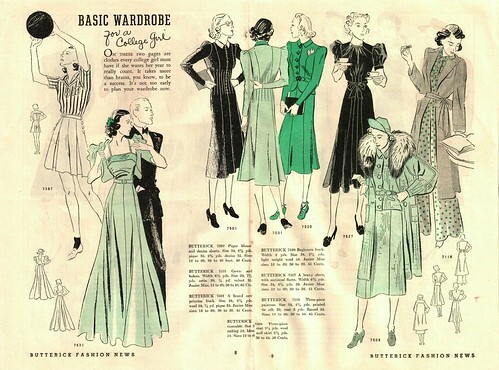 This is the sort of wardrobe my Grandma had in college (I've seen pictures from then; she was so well-groomed). I'm probably the last person to think clothes are all-important (despite spending all my hours thinking about sewing them, haha) but it would be really nice to see current style turn the corner again. I don't think it could get any less elegant (to say it nicely) than it has gotten.